You can exchange the adapters via the web or an Apple Store. But, be sure to stop using your currently USB adapter immediately…stick to car and computer charging! Click HERE to get the full details and how to go about exchanging your USB Power Adapter. 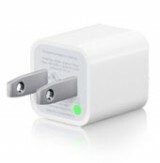 Below are screenshots of what the power adapter looks like. If yours has a green dot on it (as shown in the second screenshot) you already have the “new” power adapter and do not need to exchange yours. If yours does not have a green dot, you will want to head over to Apple’s website to see if you need to exchange your adapter. I liked the chargers that came with the 1st gen better!! I love that they folded! Ginger, does the iPhones in the UK are already network unlocked from AT&T or the UK carrier has to request an unlocking code from Apple in order for yall to use the iphones in the UK? so it tells me to stop using the adapter. so if u dont have a computer nearby i cant charge my phone for a couple weeks? You’d think Apple would send out an e-mail to their customers about this, but instead I had to read it on AiPS. Oh, and I second edden’s comment about the Oct. 10 delay. I’m lucky that I have my computer to charge it, because I gave my dad my old iPhone and charger. they need the serial number for the iPhone 3G if I need to go to the Apple Stores for the exchange. I have 2 iphone 3G, but I don’t even have an iPhone contract with AT&T and Apple, I just using them with my AT&T sims after jailbreaking both phones. Any solutions for me to get the new USB power adapter? Anyone? how stupidER and more pathetic can apple get with this iPhone 3G??? first… a buggy a** firmware that took 3 months to fix and millions of frustrated users not being able to backup or use a single app of the famous app store, simply because they crash as soon as they load! now this… a “kill yourself and your child” cheap a** charger? I simply wonder, what’s next apple? Does anyone have any idea what the new chargers look like? They will probably look like the one in the pics above with the green dot. Haha, Funny thing is that I still use my firewire charger from my RIP ipod Mini to charge my phone! Love it!